Serves 4 – 25 minutes to prep, 20 minutes to cook. 1. Bring the stock, ginger,3 coriander leaves and 250ml (1 cup) of the coconut milk to a simmer in a deep frying pan over low heat. Add the chicken and cook for 15 minutes or until the chicken is just cooked. Remove from heat and set aside for 5 minutes to infuse. Use tongs to transfer the chicken to a plate to cool. When cooled, shred the chicken. Combine the lime juice, fish sauce and remaining coconut milk in a small bowl to make a dressing. 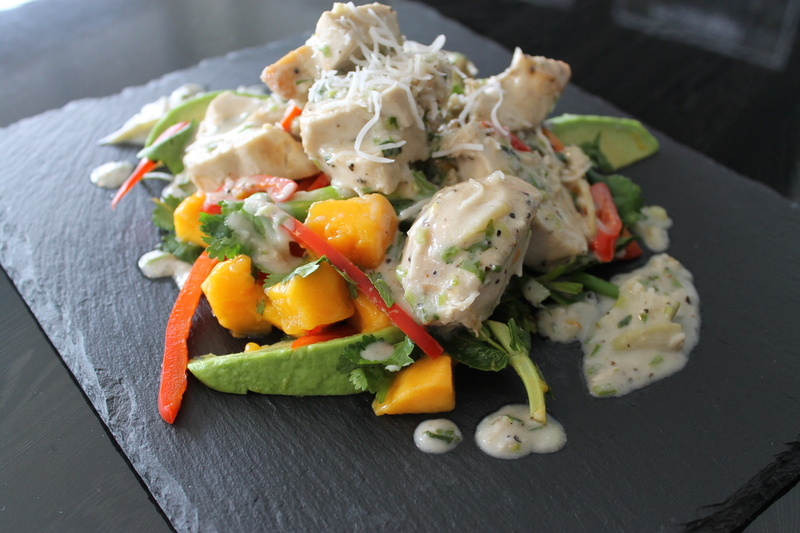 Add the shredded chicken to the dressing and combine with the mangoes, avocado, capsicum, spring onion, chilli, 2 coriander leaves into in a large bowl. Transfer to a platter. Sprinkle with the cashews and the remainder coriander on top.